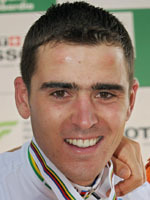 Since crushing the mountain bike field at the 2004 Athens Games Frenchman Julien Absalon claims never a day goes by without him focussing on the defence of his Olympic title in Beijing. This same zealotry saw the man from the Vosges mountains power his way to four straight world championships titles from 2004-2007, which is a first in this sport, thanks to meticulous training and his voracious will to win. Even more worrying for his rivals, Absalon seems to get better each season in this cross-country event (approx. 50km/ 2hrs, 15min) which requires constant explosive efforts due to relentless attacks and counter-attacks. Born in August 1980 in France's eastern mountains a family friend initiated him to the sport as a teen and within months he had managed fourth place in the French championships. There the coach Gerard Brocks took him under his wing and guided him to world junior and under-21 titles before he joined the elite in 2003 as part of the Bianchi team run by 1965 Tour de France winner Felice Gimondi. He concentrated on the World Cup in his first elite season and won it, also managing silver at the European championships. But it was a weary athlete that struggled home 12th at the world championships that same season. That first disappointment seemed to forge a new vigour in him and on the rugged slopes of the Parnitha at the Athens Olympics the 24-year-old had a full minute to spare at the finish line over Spain's Jose Antonio Hermida and 2min 3sec on 1996 gold medallist Bart Brentjens of the Netherlands. Seventy supporters from his home village of Raonnais having made the trip to Greece in 15 camping cars cheered him on to his gold in 2hrs, 15min, 2sec on seven laps of a challenging 43.4km course. That year he also went back to the world championships and bannished the bitter memories of the previous year by grabbing his first senior gold. Absalon has remained world champion ever since, placing the rainbow jersey at his bedside to inspire him even in his dreams, celebrating his victories by hoisting his mud splattered bike aloft at the finish line. 2006 was a wonderful year for him, claiming the world championship, world cup and the European championship. In 2007 he became the first man since the creation of the world championships in 1990 to win a fourth straight title, and he won the World Cup with an event to spare. He began the Olympic season with three World Cup victories but his 2008 season then turned into a nightmare with a series of defeats, including a woeful 15th place at the European championships and a retirement from the world championships with sunstroke. Is it just a blip or the end of an era? The answer will be known in the Chinese capital.